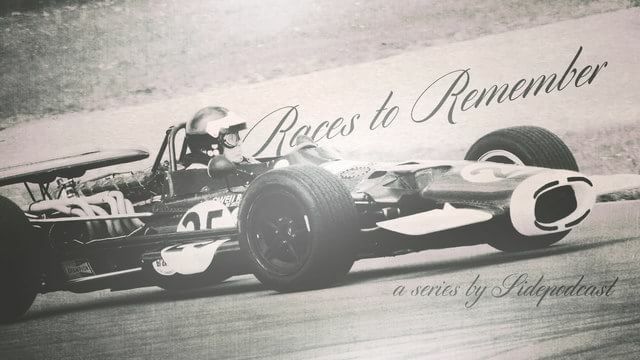 Hello and welcome, you’re listening to Races to Remember, a mini series brought to you by Sidepodcast. During this second series of memorable races, we’re looking specifically at those which have broken records or stood out because they are the longest, the shortest, the highest or the lowest. So far, we’ve looked at a number of different feats, but today’s is slightly different. It’s the South African Grand Prix of 1962. In 1962, the South African race was held at the Prince George Circuit in East London – a destination Formula One only visited a handful of times before the action moved to Kyalami. What’s special about this race is that it was the latest an event had been held in the year, taking place on the 29th December. Not only was it a late one, but there had been a whopping three months wait following the last championship race, and the title was still up for grabs. Graham Hill was leading the standings, with 39 points, and Jim Clark was chasing him in second place, with 30. The top six positions would get points, the winner receiving nine. Jim Clark needed to win the race to secure the championship, and although that would only put them on equal points, the system back then only selected the best five results. That would give Clark the title. Clark was driving the new Lotus 25, designed by Colin Chapman for the 1962 season. It was a unique design, with a far stronger cockpit than others on the grid, a chassis that weighed a lot less, and a car that was generally a lot lower to the ground. The car was considered to be a risky design when it was first introduced, but its debut season in 1962 saw Jim Clark power to three race victories, and battle for the championship. With one race left to go, it was in the hunt to take the Scottish driver to title victory. Clark made the best start to his weekend by qualifying on pole position, but Hill was second on the grid and ready for the chase. Jack Brabham was third, with Innes Ireland in the Lotus fourth. Clark managed to retain his lead off the start line, and was dominant for the first portion of the race. He pulled out a healthy lead, but about two thirds of the way through the race, the engine started smoking. Clark pitted and retired, the car suffering an oil leak. Graham Hill, who had been left behind in second place, inherited the lead and went on to win the race and the championship. Two Cooper cars of Bruce McLaren and Tony Maggs rounded out the podium three. The championship victory was Hill’s first of two, the second coming six years later, after he switched to the successful Lotus team. Jim Clark went on to win two titles as well, the first of which came in 1963. Sticking with the strong Lotus 25, Clark won seven races that season, and he finished on the podium in two other events. The final race of 1963, also at East London, was held on the only slightly earlier date of December 28th. Jim Clark had already wrapped up the driver’s championship, but was given the chance to avenge his disappointment from the previous year. The dominant Lotus started from pole position on the grid, and Clark won the race by over a minute. That’s all for this episode of Races to Remember, all I can say is I’m glad the F1 season doesn’t drag on that late anymore! Let me know what you think of a two month gap to decide the championship, by commenting on Sidepodcast.com or sending a message via the form sidepodcast.com/contact. I’ll be back tomorrow with our penultimate episode of the series.